I just loved the idea of The Secret Recipe Club when I saw it and I have joined up. Each blogger is assigned a participating food blogger to make a recipe from. As it’s a secret, all posts are published at the same time from each group of bloggers. I was given Jennifer Sikora’s blog For Such A Time As This as my secret blog. Jennifer has been blogging since 2007. She is a baker, loves to shop and is a dog mom – sounds like we have a few things in common. I chose Jennifer’s recipe for Herb Crusted Pork Loin as the dish I would prepare. Below you will find my adaption of the recipe. This was made necessary as I could not find untrimmed pork loin and so bought a pork belly roast to cook. As the weight of my roast was exactly half that of the one given my Jennifer I halved her rub. You could smell the garlic cooking, and the meat tasted great. What a great way to try something new! Yum! Looks great! SCR is turning out to be lots of fun — so many new recipes to try! This looks great! I’m always looking for new pork recipes so thanks for sharing! This looks so yummy! Great pick for the SRC!! I’ve never had pork belly before. Looks amazing! Mmm pork belly… the best meat ever! I bet this was delicious! What a wonderful idea: The Secret Recipe Club…you find so many new and exciting link up ideas …and this one sounds like alot of fun. Your recipe turned out wonderful! thanks Yvette – it is a great idea! it was great fun and the added bonus was the meal was great! Yum! 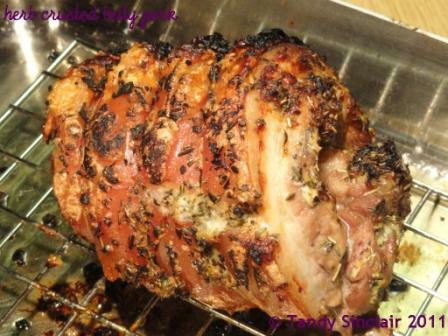 This looks great, love a good pork roast! Tandy, this pork belly looks delicious with all the herbs and garlic…what a nice feast! I adore herb crusted pork! I have a hard time finding pork roasts and bellies around here. Wow,Tandy – this looks delicious!!! I love this idea of the secret recipe!!! Wonderful! Hope you join in for next month! Love pork at the moment, maybe it is because lambs is so expensive. Love the herby crust! Oh, I have pizza on the menu for tonight, but after seeing this roast my plans are changing! What a great combination of spices. I’ve never roasted a pork belly before – yours looks excellent. It must’ve tasted great. I like how you crisped the outside on the grill as well. HI Lisa, for sure I will check out your blog post! Please give this recipe a try as it was really tasty 🙂 Thanks for the visit! The secret recipe club sounds like fun and you definitely chose a winner to try out. Great photo Tandy.